In 1972, Four Wheel Campers started selling pop-up campers for pickup trucks. The streamlined designs, lightweight and flexible aluminum frames, and heavy duty vinyl made them an instant hit with serious off-road travelers. Fast forward to the present, and Four Wheel Campers still inspire the same enthusiastic loyalty. In fact, those in the know say if you find a used one for sale, buy it immediately. They rarely become available because people love them so much. 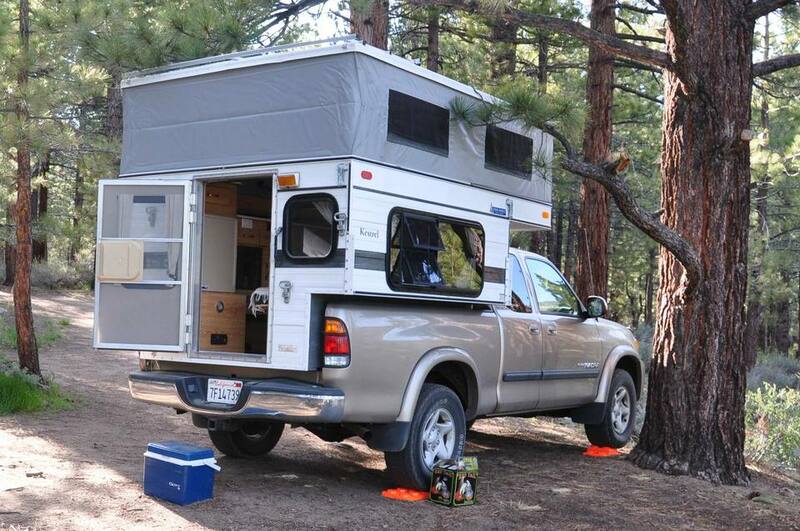 Four Wheel Campers withstand the toughest off-road conditions but still provide the comforts of a camper. The soft top pops up with minimal effort to give you more than 6 feet of headroom in camp, then locks down for more aerodynamic travel when you're on the move. The Hawk fits most full-size, half-ton, 6.5-foot regular bed trucks. But you can find models to fit most any pickup, including mini, mid-size, and flatbeds. The campers come with a range of amenities, starting with a stripped-down shell model up to a fully tricked out Woolrich limited edition including a wet bath. Four Wheel makes the lightest pop-up campers on the market, but you still might want to beef up the rear suspension on your truck to compensate for the added weight. The all-welded lightweight aluminum flex frame handles almost any rugged off-road terrain. With a Four Wheel Camper, you can choose remote camping destinations without having to worry about your camper rattling apart on primitive roads or overland terrain. Older versions of the Hawk Four Wheel pop-up camper were called Kestrel and Eagle models. The Eagle model came after the Kestrel model, which was designed to fit an older style full-size pickup truck (such as a 2002 Toyota Tundra). Both were about 6 inches wider at the base than other Four Wheel models, providing more interior space but making it difficult to fit them on newer pickups, which tend to have more narrow bodies. Make sure you verify compatibility with your vehicle before you purchase a used camper; the manufacturer recommends that you measure your truck bed and the width of your tailgate opening and compare it to the width of the camper you intend to buy. New Hawks come standard with an electric water pump; 20-gallon freshwater tank, and LED lights. They are wired for solar power, with panels available in various capacities as an optional add-on when you purchase from the manufacturer. You can also upgrade to fiberglass siding, add a forced air furnace, and configure the dinette seating area to convert into an interior shower and/or toilet.